Winners » June 2007 Casino Wins » June 21, 2007. UK Gardener Rakes In World Record Million-Dollar Online Casino Jackpot With Just 9 Pence. 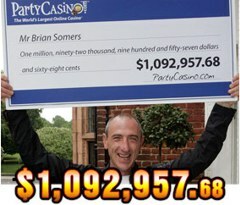 Congratulations to Brian Somers, a 39-year-old self employed landscape gardener from a council estate in Sunderland, UK, who is celebrating after raking in a record Party Casino's jackpot of $1,092,957.68 (£551,000) from an 18 cents spin (9p)! Brian, who earns between £5,000 - £10,000 a year, won this huge Party Mega Jackpot on the Super Fortune Wheel slot machine game at the online casino last week and such a big progressive jackpot from such a tiny stake is a world first. The winner had deposited $100 (£50) the day before. "All of a sudden the screen started flashing," said Brian. "I was asked to choose six smiley faces. Four revealed golden dollars and the ticker at the top of the screen started to race and all these numbers came up. It said I had won over a million dollars. I thought it was a mistake. I turned the computer off and even unplugged it. I then logged back on saw $1,092,957.68 on the screen and got on the phone and they said 'your balance is over $1 million dollars sir.'" "The way I see it is that this is the perfect amount of money to win. I will just be more relaxed in my life going forward. I've just got a permanent smile on my face, like those smiley faces that brought me my win! I’m the luckiest man alive," continued the winner. "I got my mate Stevie to come around, who was doing some painting and decorating next door. He was more excited than me as I was in complete shock. I was speechless. Stevie didn’t go back to the painting that day - he just left the pots on the floor in the house next door." Lucky Brian is a separated father of one but intends to secure the future education of his 6-year-old son Corey with his windfall. His mother lives just down the road and his two brothers and three sisters all live in the local area. "I'm hoping to use the money to make myself and my family secure for the rest of their lives. I want to buy a house, go on holiday and get a new car. I also want to expand my gardening business. I have turned down jobs because I hadn't got one of those big motorized mowers and definitely want to get one of them," said lucky father. "I will give my Mom whatever she wants. I want to do a nice job on her back garden - get a new patio and some nice garden furniture. I’ve done the front garden already but now I’ve got enough money to do the back." Brian has been in London staying at an exclusive 5 star hotel in Kensington with his brother Sean, 37. "I got a call from a client and I said I wasn’t available for a little while but had some news for her when I got back. My mate ‘dozy’ Dale has already rung up and wants the van for nothing. Isn’t that cheeky?" During the week in London they have been sight seeing and also think they spotted american pop star Michael Jackson sneaking into a building across the road. Brian is a big Sunderland FC supporter and now they are back in the Premiership is thinking about getting a season ticket. His previous biggest win was £40... on the National Lottery. A Party Casino spokesman said: "We've seen some big winners in our time but for someone to win so much from just 18 cents (9p) is truly remarkable and is a record win. Brian is a great guy and deserves it. We wish him and his family all the very best for the future." Party Casino is a popular member of PartyGaming Plc's growing suite of online gaming sites that includes Party Poker, PartyGammon, Party Bingo, PartyBets, Gamebookers.com and Empire Poker. The casino offers over 80 games from blackjack and roulette to the variety of video poker games and over 30 slots. Most modern slot machine games have random progressive jackpots and exciting bonus features. Try playing movie themed slots with 4 progressives. Tags: Super Fortune Wheel, Million Jackpot, Record Jackpot, Party Casino.